The item A lady and her magic, Tammy Falkner, (ebook) represents a specific, individual, material embodiment of a distinct intellectual or artistic creation found in Charlotte Mecklenburg Library. 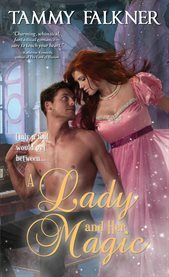 Rules Are Made to be Disobeyed... Sophia Thorne is new to the Regency's glittering high society, which resembles her magical homeland only insofar as both places are filled with ridiculous rules. Which means no matter where she goes, she's bound for trouble... And Scandals Are Meant to be Shocking... The Duke of Robinsworth has flaunted and shocked society for years. In a moment of fateful mischief, Robinsworth encounters the enchanting and distinctly scandalous Sophia. Between her streak of magical mischief and his penchant for scandal, they're about to take rule-breaking to a whole new level..